Gonzalo Higuain celebrating his goal for AC Milan. 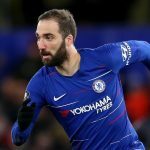 Gonzalo HIGUAIN, Ever BANEGA, Lucas OCAMPOS and Franco VAZQUEZ all scored for their clubs in the UEFA Europa League. 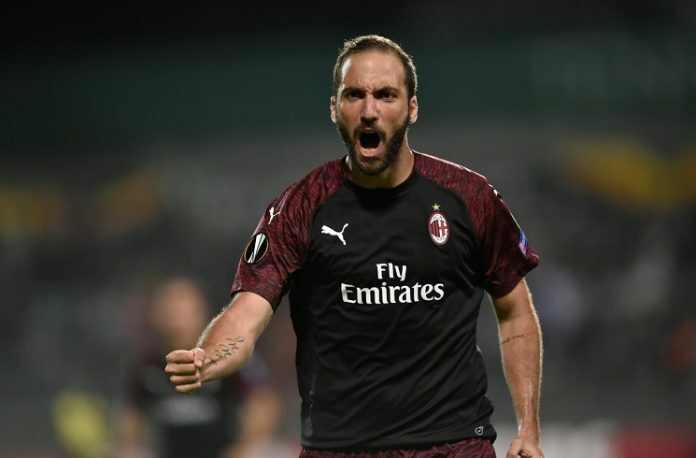 AC Milan got their UEFA Europa League campaign off with a 1-0 win away from home courtesy of a goal by their number 9 Gonzalo HIGUAIN. The former Juventus man’s shot deflected off of the opposing defender and went passed the goalkeeper. 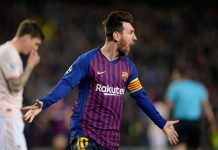 Ever BANEGA scored twice, one was a fantastic free kick and the other a penalty kick while Franco VAZQUEZ added one himself in Sevilla’s 5-1 win against Standard Liege. Lucas OCAMPOS scored for Marseille in their 2-1 loss against Eintracht in the UEFA Europa League. 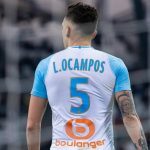 With just three minutes on the clock, Argentine Lucas OCAMPOS opened the scoring for Marseille to give them the 1-0 lead. Higuain is class. Amazing link up play almost on par with the likes of Benzema or Giroud in terms of linking up with his wingers and holding up the ball unfortunately he becomes half the player he is once he dons the albiceleste jersey. It must be a psychological issue. He’s had his chances but it’s time to move on. Much hungrier more aggressive options out there. Gio Simeone ,Lautaro,Icardi. Banega was playing like boss in the mifield. Has anyone watched lo celso how was he? Lo Celso was his team’s best player against Olympiacos, was joy to watch ,created a great chance, tried to score from outside of box once. His team lacks quality striker ,thats why despite having 73% of possession and many chances match ended 0-0. Yes I have this feeling too, betis is a team with many technical midfielders, fullbacks and wingers but unfortunately no striker for the finishing. Lo Celso seems very comfortable in this system with that type of players around him. I hope to see more often the pair Lo Celso-Canales and not just one of them.